TrueBlue Safe and Sure Eye Wipes must have been made with me in mind. I’ve recently had a lot of trouble with my dog and allergies. As a consequence, staining has started to be noticeable. My dog is a Shih Tzu and his allergies have been the worst I have seen them in 9 years. I’ve been looking for something safe for my dog that doesn’t involve using antibiotics which I had heard was in other brands. No thanks! I want antibiotics to actually work for not just my dog, but everybody’s so I won’t use them unless and until it’s necessary for a serious medical condition. Yes, you read that right. I was so excited to hear this! This pre-moistened pad uses Witch Hazel to clean the stain away while the lavender, organic aloe vera, chamomile, glycerin, citric acid, natural preservatives,Vitamin E, licorice extract, oat amino acids and cucumber not only smell good – lavender has been known for it’s calming properties – they also soften and soothe sore skin. There are no detergents (yikes!) alcohol, parabens (chemical preservative that mimics estrogen and causes breast tumors) or phosphates. This botanical mix is just the kind of product I prefer, so I don’t have to worry about anything bad for my dog getting in his eyes. True Blue Safe and Sure Eye Wipes are hypoallergenic, easy to rinse, PH-balanced and they are cruelty-free, biodegradable and made in the USA. Whew, what a list of good things…and there’s one more. The company even donates to a public service program called the People-Pet Partnership at Washington State University, College of Veterinary Medicine promoting the human-animal bond for humane treatment of companion animals. TrueBlue Safe and Sure comes full circle, literally wiping away tears on the one hand, while preventing tears through education on the other – nice! So if you really needed one more reason to try these wipes for your dog, this should have pushed you over the top It worked that way for me. 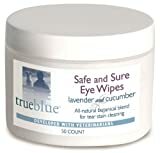 TrueBlue Safe and Sure Eye Wipes come in a plastic jar with 50 pads. I usually use two per session, but you may find you need less depending on how much stain you have to work on. Why put up with those nasty stains when you have such a well-researched product available? Eliminate unsightly tear stains with our safe, yet effective, cleaning solution on pre-moistened pads. Witch Hazel cleans away dirt and stains while lavender and cucumber soften and soothe the skin. A portion of the proceeds is donated to the People-Pet Partnership. Find more TrueBlue Safe Sure Eye Wipes products on Amazon!